Organic body butter is to the skin what luxury organic chocolate is to the taste buds - divine. 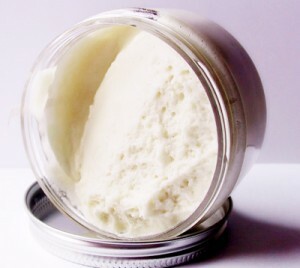 A body butter is one of the most natural ways to restore suppleness and moisture to the skin virtually in an instant. So thick and intensive is it's effect it actually creates a protective barrier to help dry or cracked skin heal itself. Cocoa, shea and mango butter are three of the best ingredients used in organic body butters. Cocoa is very rich and high in antioxidants; best for sunburn, scars, stretch marks and wrinkles. Shea is rich in vitamins A, E and F and enhances skin renewal and increased circulation. It's good for eczema, dry skin and nappy rash. Mango butter is high in essential fatty acids and antioxidants. Incredibly moisturising mango butter is good for stretch marks and restoring skin elasticity. Some of the best organic body butters and lotions available are the Geranium & Orange Body Butter (with shea butter) by Neal's Yard Remedies, Rescue Me Face & Body Cream S.O.S (with shea butter) by Barefoot Botanicals, Rose & Geranium Body Lotion (with cocoa butter) by Neal's Yard Remedies and Combination Skin Balancing Cream with Calendula (with mango seed butter) by Lavera Faces.